Amidst the deepening economic crisis that began to spread globally in 2008, the Malaysian overall trade performance recorded a 6.8% growth where exports and imports increased by 9.6% and 3.3% each. Exports earnings for the year 2008 were valued at RM663.5 billion, of which 3.4% was contributed by the timber sector, a rise of 0.3% to RM22.79 billion from RM22.72 billion in 2007. The timber sector is the 5th largest export earner after electrical and electronic products; palm oil and palm oil-based products; and crude petroleum. Heading the list of export earnings from major timber products in 2008 were Wooden Furniture with registered growth of 3.8% from RM6.7 billion to RM6.9 billion; Plywood valued at RM6.3 billion, an increase of 0.9% followed by Sawntimber and Logs with lower export revenue of RM3.1 billion (-2.6%) and RM2.1 billion (-2.6%) respectively. Medium Density Fiberboard (MDF) and Builders' Carpentry and Joinery (BCJ) each contributed over RM1.0 billion respectively. In terms of contribution towards the total exports of Malaysian timber products, Wooden Furniture accounted for 30.4%; Plywood – 27.8%; Sawntimber – 13.5%; Logs – 9.0%; Medium Density Fiberboard (MDF) – 5.1%, Builders' Carpentry and Joinery (BCJ) – 4.4%, Mouldings – 3.3% and Veneer – 1.9%. As for the leading export destinations for Malaysia's timber products, Japan and USA maintained their position with a market share of 21.1% and 11.5% respectively while Korea was overtaken by India, whose imports from Malaysia accounted for 5.4%. Value wise, export receipts to Japan fell by 1.1% to RM4.8 billion and correspondingly, USA fell by 10.3% to RM2.6 billion. India has emerged as an important market to watch as its imports soared by 17.2% to RM1.2 billion. From a market perspective, while the traditional markets of the USA, Japan and the EU continued to absorb more that a third of Malaysia's total exports of timber products in 2008, the emerging markets such as China, India, Poland, the UAE, Saudi Arabia, Brazil, Russia, Kazakhstan and Ukraine have shown significant expansion both in terms of growth and market share. 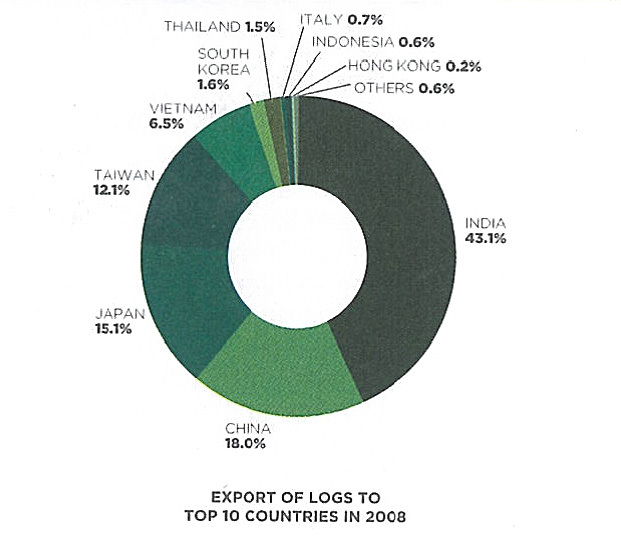 Logs, Malaysia's fourth largest export item made up 9.0% of Malaysia's total timber exports in 2008. The stagnant effects of the global downturn can be demonstrated from the export performance of Malaysian logs where export revenue remained at RM2.1 billion while decreasing 6% in volume to 4,368,403 m3. India maintained its past year's top ranking as the largest market for Malaysian logs, accounting for 43.1% of Malaysia's total log exports in 2008. Export earnings from India grew by 13%, equivalent to RM886.7 million. While other traditional markets like China and Japan reduced their import of Malaysian logs, India increased theirs by 19.8% amounting to 1,891,807 m3. In 2007, China imported RM506.3 million worth of logs. In 2008, affected by the economic downturn, the total value of exports to China declined by 26.8% to RM370.5 million, accounting for 18.0% of the total exports of Malaysian logs. Volume wise, China imported 697,901 m3 of Malaysian logs in 2008, a big drop of 41% if compared to recorded figures of 1,183,286 m3 in 2007. Japan, the third largest market for Malaysian logs also ended 2008 on a low note, with exports falling in value by 12.5% to RM310.4 million. Despite the fact that the volume of logs imported by Japan was reduced by 16.7% to 589,140 m3, the Japanese market still accounted for 15.1% of Malaysia's log exports. The export performance of sawntimber had also been on a declining slope, although it contributed 13.5% towards the export earnings of Malaysian timber products. For 2008, Malaysia's export of sawntimber slackened slightly both in volume and value terms by 0.4% to 2,478,611m3 and by 2.6% to RM3.1 billion compared to 2007's export receipts of RM3.2 billion. As the largest buyer of Malaysian sawntimber, Thailand continued its uptake with export earnings of RM489.5 million which represents an increase of 4.1% over 2007. It is also interesting to note that in volume terms, this represents an increase of 4% amounting to 657,237 m3. 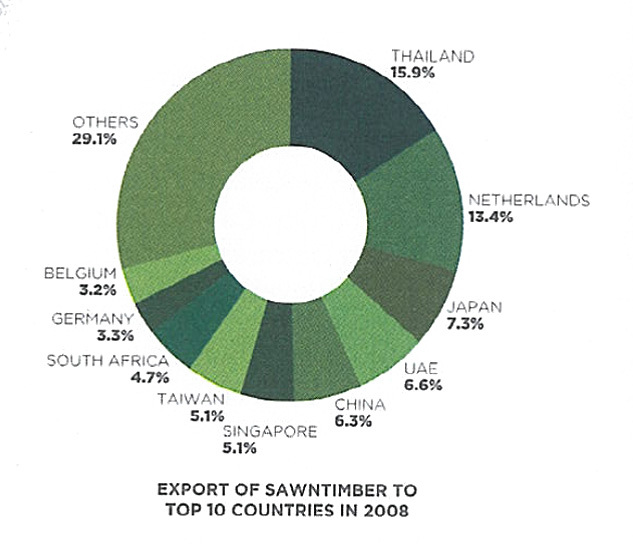 Exports to Thailand accounted for 15.9% of Malaysian total exports of sawntimber. With total imports of RM412.0 million, The Netherlands was the second largest market, accounting for 13.4% of Malaysia's total sawntimber exports. However, the value of export receipts from The Netherlands decreased by 7.5% compared to the corresponding period in 2007. While the value of exports went down, there was a slight increase of 2.8% in the volume of sawntimber imported, which was recorded at 138,058 m3. Japan's exports receipts declined 12.2% by value to RM224.3 million, accounting for 7.3% of overall Malaysian sawntimber exports. In volume terms, Japan's import of Malaysian sawntimber fell to 131,194 m3, a drop of 6.9% compared to 2007. In 2007, export of Malaysian plywood plummeted both in value and volume terms by 11.7% to RM6.3 billion and by 11.8% to 4,372,034 m3 respectively. However, in 2008, it can be seen that this sharp decline has come to an end and that the exports of Malaysian plywood is slowly recovering, increasing 0.9% in value to RM6.3 billion and 5.8% in volume to 4,624,553 m3. 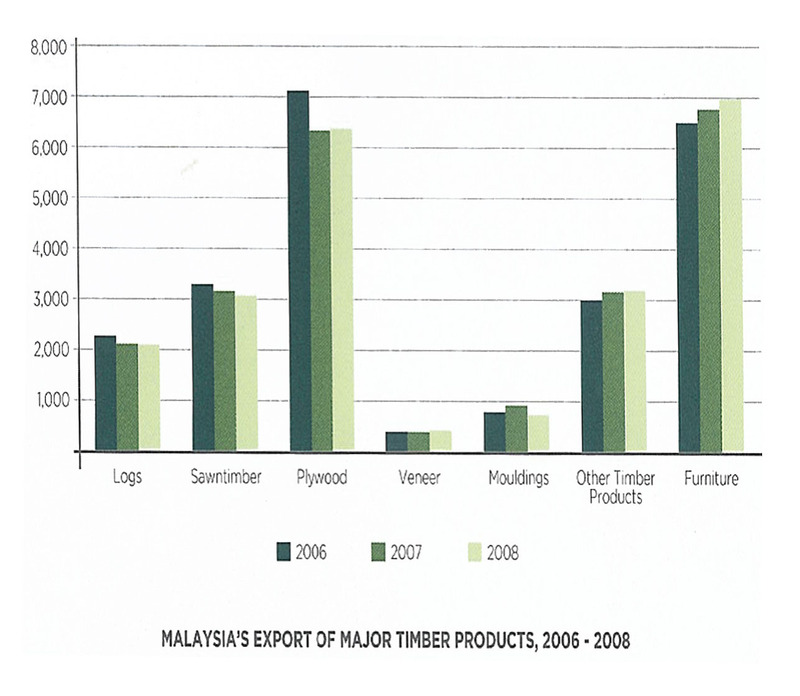 Plywood remains the second biggest earner of Malaysian timber exports for 2008, accounting for 27.8% of total timber exports. 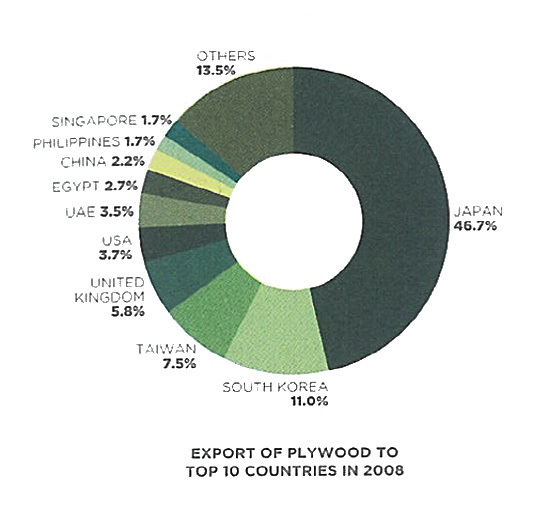 Accounting for 46.7% of Malaysian exports of plywood, Japan maintained its lead as the largest market for Malaysian plywood. However, exports receipts from Japan fell by 0.8% to RM3.0 million whereas the volume of exports to Japan rose by 5.4% to 2,041,790 m3. Trailing behind Japan, South Korea contributed 11% of exports of Malaysian plywood with import figures of 606,431 m3 valued at RM697.5 million. This reflected an increase of volume by 1.3% and a decrease in value by 4.6% if compared to earnings of 2007. With 7.5% of market share, Taiwan claimed the rank of Malaysia's third largest export destination. Taiwan's 2008 import takings were valued at RM476.2 million, a recorded jump of 10.5% from 2007 and continued this upward trend where volume of plywood imports increased by 12.5% to 397,437 m3. Medium Density Fiberboard (MDF) exports have also not been spared by the global economic downturn as 2008 exports earnings from MDF dropped by 2.1% to RM1.2 billion. The volume of MDF exported however rose by 0.7% to 1,136,182 m3. Overall, the MDF sector contributed 5.1% to the total of Malaysia's timber exports in 2008. Japan overtook UAE by accounting for 18.6% of Malaysian MDF exports, making it the leading buyer for 2008. Interestingly, while the value of exports to Japan increased by 1.6% to RM215.3 million, the volume exported dropped by 10.6% to 160,396 m3. 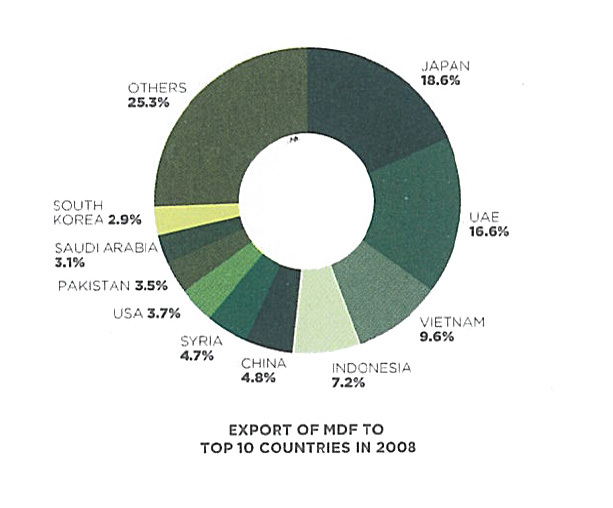 In 2008, 16.6% of exports of Malaysian MDF went to UAE. Previously the leading market destination, export receipts from UAE worth RM191.6 million had decelerated by 17%. The volume of MDF exported also fell 12.3% to 178,524 m3. The decrease in exports could be due to the slowing down of the construction boom attributed to the global effects of the subprime mortgage crisis. Vietnam remained the third largest buyer of Malaysian MDF with import growth of 10.5% valued at RM111.0 million. At 141,391 m3, exports to Vietnam amounted to 9.6% of Malaysia's total MDF exports, a rise of 21.3% over 2007. Compared to the other timber products, Malaysia's export of mouldings proved to be most affected by the global recession, posting a dismal performance for the year 2008. While it contributed 3.3% to the overall export earnings of Malaysia's timber products, export receipts from Mouldings shrunk by 15.4% in volume terms to 289,288 m3 valued at RM744.1 million, a sharp fall by 18.7% in value terms when compared to 2007. Although exports to The Netherlands dropped 8.3% to 44,900 m3, the country maintained its position as Malaysia's largest export destination for mouldings for the second consecutive year. 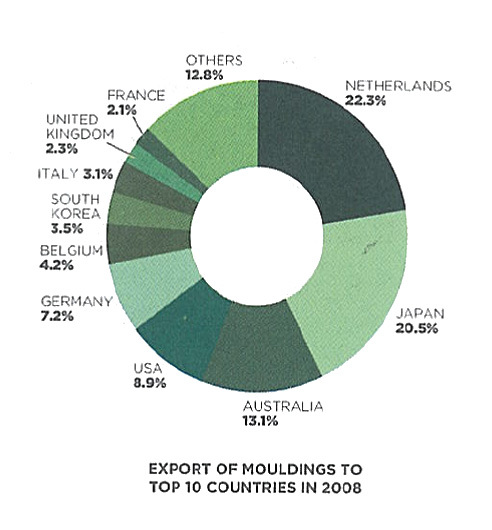 The Netherlands contributed 22.3% to Malaysia's total export of mouldings for 2008. However, the value of imports fell 13.2% with earnings of RM165.6 million. With export revenue of RM152.5 million, the value of exports to Japan shrunk by 9% and volumewise, by 17.8% to 57,882 m3. This downward trend can also be seen in the export figures from Australia where exports of mouldings dropped by 10.4% in volume terms to 41,680 m3 and down 18.6% in value to RM 97.4 million. For the period under review, Japan and Australia accounted for 20.5% and 13.1% of Malaysia's total mouldings exports respectively. Exports of veneer in 2008 ended on a positive note where a growth of 11.6% in value to RM435.3 million was recorded. The same growth was noticeable in the volume of exports by 23.8% from 333,815 m3 to 412,948 m3. 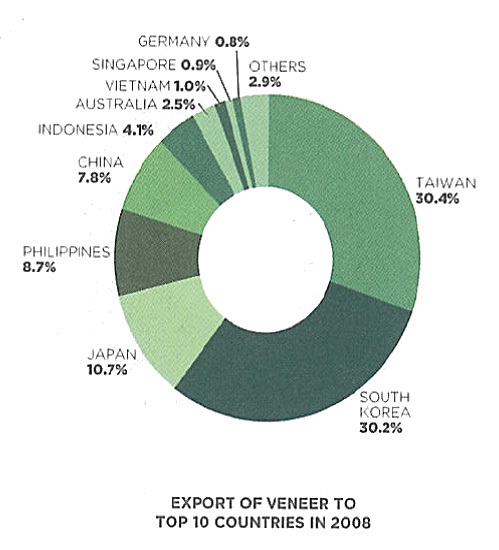 Contribution of veneer to total Malaysian exports amounted to 1.9% in 2008. Taiwan remained the largest buyer of veneer with imports worth RM132.3 million (up by 22%). Accounting for 30.4% of Malaysia's overall veneer exports, the volume of exports to Taiwan also rose correspondingly by 32.7% to 133,983 m3. South Korea also emerged as a strong buyer for Malaysian Veneer as it registered a positive growth of 1.7% in value over 2007, translated into RM131.6 million. At 132,822 m3, South Korea increased its imports by 16.1% in volume terms and accounted for 30.2% of Malaysia's total mouldings exports. With 10.7% market share, exports to Japan fell by 14.3% in value over 2007 which amounted to RM46.5 million. Import volume to Japan also underwent a decline of 16.3% to 28,420 m3. The export receipts of Malaysia's Builders' Carpentry and Joinery (BCJ) for 2008 amounted to RM1.0 billion, lower by 1.2% compared to export receipts in December 2007. It accounted for 4.4% of Malaysia's total timber based exports. 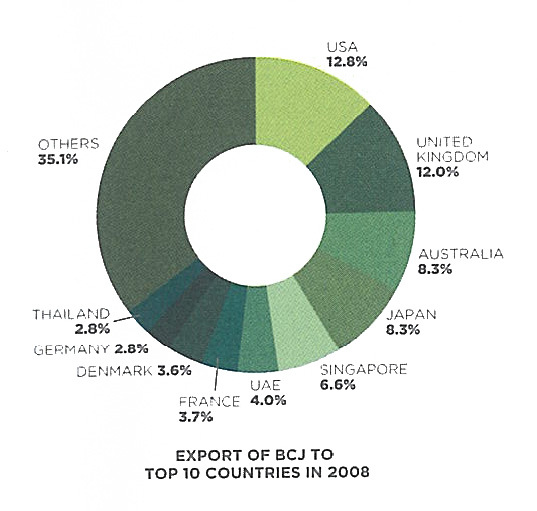 Heading the list of top ten export destinations for BCJ in 2008, USA registered a decrease of export receipts by 39% or RM128.6 million. The United Kingdom followed closely with export revenue of RM120.3 million, up by 1.9% and Australia with proceeds billed at RM83.8 million which represented an increase of 3.8%. As for market share, the USA and UK each accounted for 12.8% and 12.0% while both Australia and Japan took 8.3% each followed by Singapore at 6.6%. 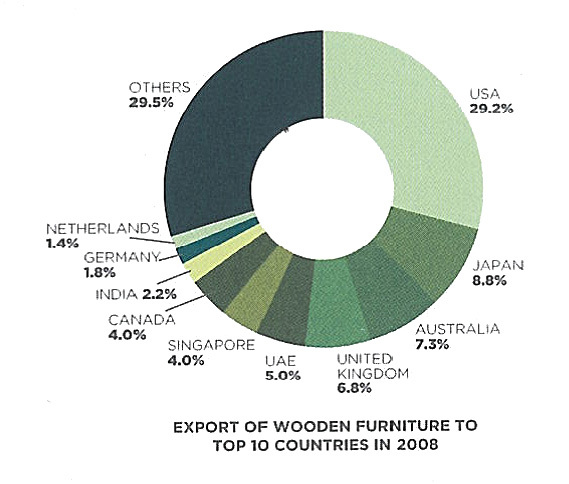 Once again, with a contribution of 30.4% translated into earnings amounting to RM6.9 billion, Wooden Furniture tops the list of Malaysia's export of major timber products for 2008. For the period under review, it is worth noting that export receipts of wooden furniture rose 3.8% over the past year. Despite the subprime mortgage crisis, USA continued to be the leading market destination for Malaysian wooden furniture with an uptake of RM2.0 billion, up 1.6% when compared to imports in 2007. USA's market consumption of Malaysian furniture exports amounted to 29.9% in 2008. For the same period under review, Japan fell 2.2% in export receipts worth RM607.9 million, accounting for 8.8% of total Malaysian wooden furniture exports. Meanwhile, exports to Australia amounted to 7.3%, showing a sharp drop of 8.4% to RM503.5 million.